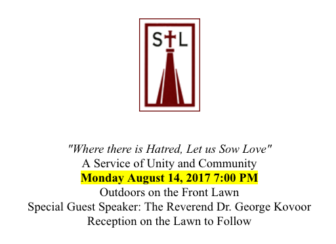 The public is invited to an outdoor service to answer the hate shown in Charlottesville, Va. this weekend with a re-affirmation of love for all people at 7 p.m., Monday, Aug. 14 at St. Luke’s Church. “[W]e want to lift up the spirit of oneness that we have as children of God. In the poetry of St. Francis, we resolve: ‘Where there is hatred, let us sow love,'” St. Lukes Rector David Anderson wrote in an email to members of St. Luke’s Parish. The service is open to the entire community. The Rev. Dr. George Kovoor, pastor of St. Paul’s Episcopal Church in Darien, will be the “special guest speaker” at the event, which will be held on the front lawn of the church at 1864 Post Road. A reception on the front lawn will follow. Image from the email sent to St. Luke’s Church parishioners. Our neighbors of all color are looking to us, to see if we have the courage of our gospel conviction, to see if we will stand up for the folks on the edges. And we know that whenever these violent attacks come against one minority, all the marginalized start to worry. Racial and sexual and religious minorities, immigrants — they wonder if anyone has their back. They look to religious people to see if they will walk the talk and embrace them in safety and love. We want to let our light shine at Saint Luke’s. On Monday night, Aug. 14 we will present an inspiring service of music and prayer, with special guest speaker, the Rev. Dr. George Kovoor. 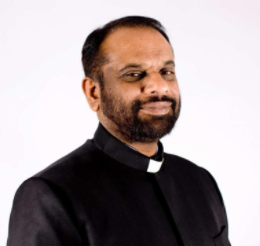 George was born and raised in India and studied at the University of Delhi before being ordained as a minister in the Church of India where he served for a decade. After leaving India, he spent 30 years in the United Kingdom, working as a pastor and principal of Trinity College. He became a chaplain to Queen Elizabeth II. George serves now as the rector of St. Paul’s in Darien, and we are delighted that he will be with us to speak about a message he has carried for over 40 years: the oneness of all races and peoples under God. Monday Aug. 14 happens to be the day the Episcopal Church commemorates Jonathan Myrick Daniels, the young seminarian who answered the call of Dr. Martin Luther King, Jr. in August 1965 to come to Selma, Alabama to secure for all citizens the right to vote. Daniels took a shotgun blast while shielding 17-year old Ruby Sales. In 1991 the Episcopal Church declared Jonathan Daniels a martyr. Monday, Aug. 14 then, is a perfect day to gather in celebration of the truth for which Jonathan Daniels died: that the love of God knows no bounds. Join us. Invite your friends and neighbors who need to be inspired and encouraged in what is good and right. Let us sow love. With the invention of the printing press, so went the practice of writing the bible by hand — until Saint John’s Abbey in Collegeville, Minnesota, produced a 1,165-page handwritten, gold-illuminated bible in 2011. A limited edition of one of the seven volumes of The Saint John’s Bible is on display at Saint Luke’s Episcopal Parish for all to view for one year. The Choirs of Saint Luke’s Parish in Darien, and Christ Church in Greenwich will sing a service of Choral Evensong on Saturday, Nov. 18 at 5 p.m. at Saint Luke’s. It’s been 23 years since a White House staffer’s mysterious death, charges of corruption and rumors about the president led to a special prosecutor’s appointment. That was Whitewater in 1994, and that special prosecutor was Darien resident Robert Fiske Jr. But Fiske’s illustrious legal career dealt with much more: Three Mile Island, the Americas Cup, drug lords and yes, even doing legal battle with Donald Trump.